The phrase "Momma! I'm bored!" is one that I hope to NEVER hear come from my son's mouth. Before we embark on any lengthy trip, I select toys, activities, and pack them up for Lucas. It may take some planning-ahead at first, but your peaceful ride will be more than enough payment. Once your children get older, you can easily involve them in the planning process, too! Lucas received one of these as a gift from my Great Auntie Karen, and he instantly fell in love with it (and I'll admit, I did too!). 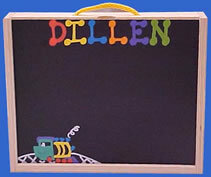 It is a wooden box with a personalized chalk board on one side, and a dry erase board on the other! The fron slides up to reveal storage inside! They're hand made in Michigan by Karen Kennedy, and super, duper awesome! I made one of these for Lucas, and he LOVES it. 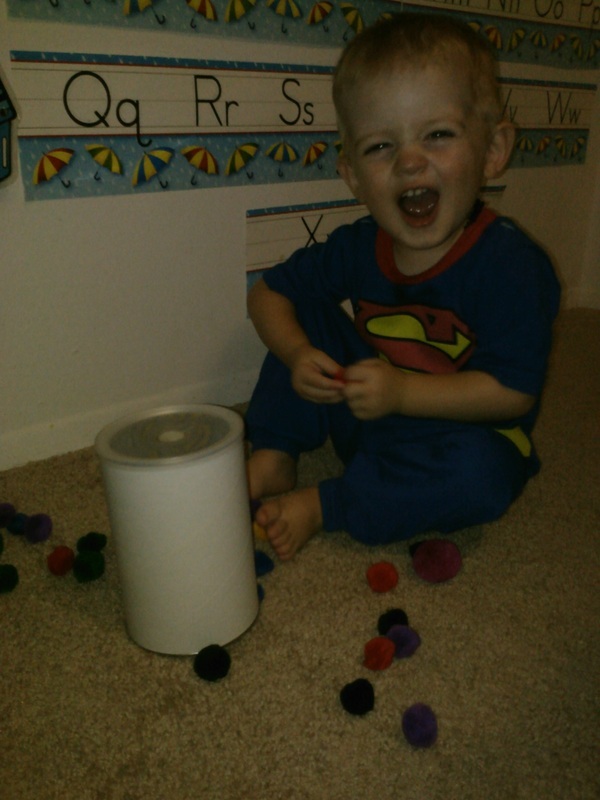 All I did was take an old oatmeal container and cut a small, circular hole in the center of the removable lid, and gave Lucas a bag of dollar-store Pom Pons. 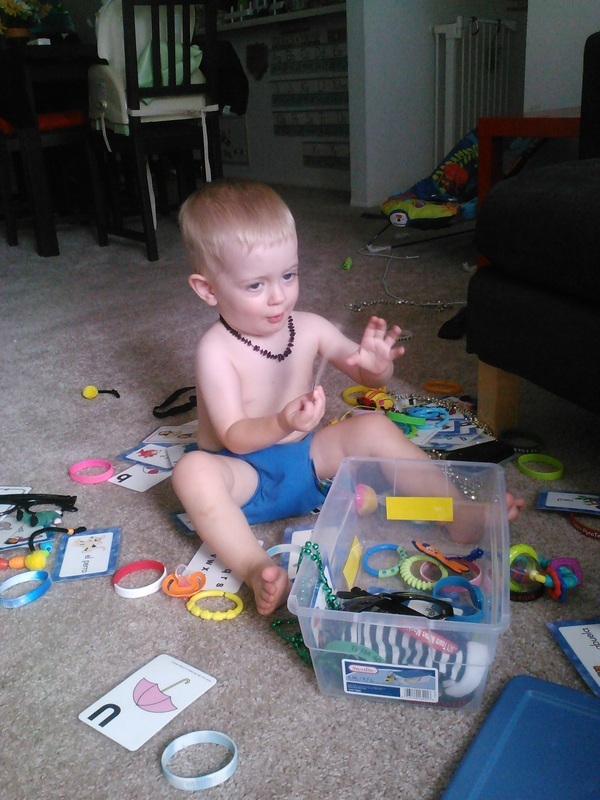 You can play counting games, practice sorting (by size, if you bought a bag with a variety of sizes), identify colors, and even adding and subtracting. You know all of those little toys that your kid is always acquiring (from where, exactly, nobody's sure! ), and you have no idea where to put them all? Well, I have a solution for you! Put them ALL into one plastic bin and call it a Busy Box! Then, when you're in desperate need of 15 minutes of peace, pull out the box and let your little one go to town! You can even make multiple Busy Boxes by categorizing or numbering your boxes, and putting a couple of your kids' favorite toys in each one, that way it's always a treat to discover what's inside! Boxes can easily be taken on-the-go! I got Lucas a Leap Frog Dry Erase book for about $3 at Barnes and Noble, but I imagine you can buy them just about anywhere in the Kids' book section. There are several versions that include numbers, letters, cursive, math, and more. They're just the right size (about the size of a regular paperback book) for travel, too! The age suggestion is Kindergarten, but I think that it's never to early to introduce kids to numbers and letters. Lucas may not be able to trace the shapes of the characters now, but he enjoys scribbling on the pages, and pretends he's writing. Each set comes with one dry erase marker, which has a felt tip for erasing the mess your kid has made on the book. 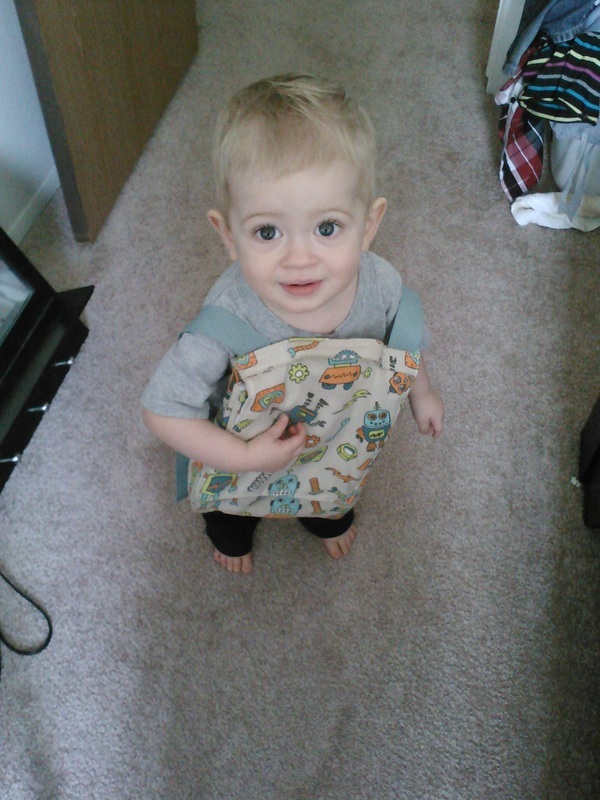 Invest in a nice backpack that your toddler can wear themselves. Every time you go somewhere, let them pack it full of stuff to keep them busy on your trip. By allowing your child to pick their own toys, you're involving them in the process, and they get excited when they open the backpack and remember what's inside! Our rule is that Lucas has to carry his backpack when we go places. Mom and Dad aren't responsible for keeping it safe!